We have a number of interviews with ex-consultants, click here to have a look at some of our most recent inside view based articles. I met Nika on Monday in central London for a drink after work. I was interested to find out what a fellow Warwick graduate and a new Googler made of the world post-consulting. We chatted about her time at Morrisons Online and how it compared to her role at Accenture and, of course, how is working for Google now. Nika’s story gives some important lessons on how to maximize your development post advisory. 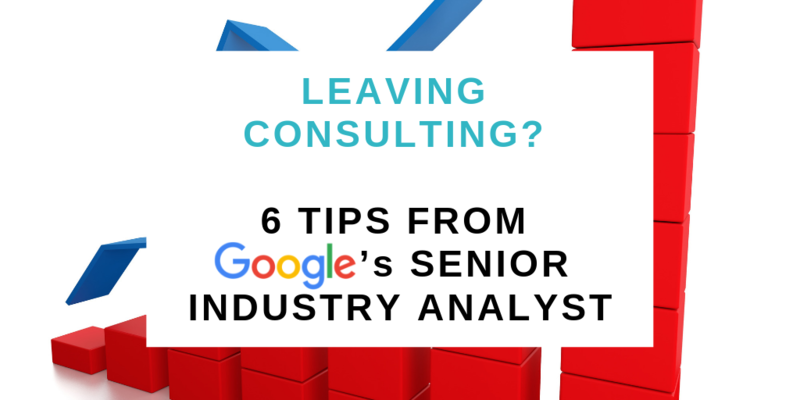 Why did you decide to leave consulting? I wanted a new challenge and to further develop my expertise in analytics and digital. It was daunting to search for jobs with so many job boards to plough through and recruitment agencies constantly hassling you. I wasn’t sure who was hiring consultants and where I should start looking. A friend in consulting recommended using movemeon because of its’ niche focus on jobs that require a consulting background. Movemeon was the ideal solution, no-one was hunting me down and putting me forward for roles I had no interest in – it was all driven by me. I applied for roles I liked and had control over the process. I was after this hands-off approach (yet I knew if I wanted to get in touch with someone from movemeon I could) so this felt like a perfect fit. The application was really straightforward too and I heard back from the employer promptly. This is how I landed my first job out of consulting at Morrisons Online. How was the transition to Morrisons Online? I loved working at Morrisons Online! I am very much a ‘yes’ person when it comes to new opportunities so it was great fun just diving in. I wanted to work in digital so being there when Morrisons Online was just launching was incredible. In a way, it felt like I was working for a start-up; the vibe was really exciting and the culture really fitted my personality. We were starting from scratch, which meant we had to build everything from the grounds up for our analyses and analytical modelling. We were all new, figuring it out and verifying our hypotheses as we went. It was a crash course on how to run a new business – we had to be creative and learn on the job. Looking back at it, it was absolutely the right opportunity to take on after consulting. My team was great and I am still friends with them now (we used movemeon to recruit into our team due to the positive experience we personally had with it). What are the differences between working in a consultancy and in industry? In consulting, you work on so many different projects, especially when you are junior. At Morrisons, I had to become an expert in my area very quickly. I also did not travel that much but that was actually quite nice. I had time to see my friends instead of spending the weekend doing laundry! I’d say consulting is definitely the best first job after finishing university. You learn the skills we now take for granted like work ethic, managing expectations, time management, learning to fail and learning from your mistakes with the safety net of a big company with all the resources you could want in order for you to develop. How does Google compare to all your experience up to date? Working in Google is incredibly collaborative. They make it really easy for you to work too; the tech always works and you have all the equipment you need so you can focus on the core of your job. You can call on experts as and when you need which allows you to move fast and really get things done. I work on conducting analyses and insights for FMCG brands, to help them develop their digital marketing strategies. We try to understand and make sense of online customer journeys and behaviours. I get very undefined problems and briefs and try to make sense of what is actually happening in order to answer how these problems can be tackled. Of course, it is challenging, but that is what I am after! My immediate team is 7 people, but the hierarchy is flat. I really like Google’s ethos around learning and failing fast. It’s about innovating and always trying new things, and if something is not working, then it’s just about moving on to the next solution quickly. Any tips for our members thinking about moving on from consulting? 1. Choose your manager well – make sure they are someone you want to learn from, and someone who is willing to teach you. Be honest with yourself around what you need and want, and look for a manager who can teach and inspire you to achieve that. 3. Choose jobs according to your potential – you can always learn as you go. The great thing about consulting is that you gain the skills to learn and adapt quickly. 4. Learn by discussing you ideas and theories with your colleagues. I keep checking-in and comparing the way we each think about a problem and often that leads to the most fruitful outcomes. 5. Make a decision and commit to it 100%. This is the way you give yourself the best chance of succeeding (and other opportunities will follow). 6. Make sure you like what you do and don’t take that for granted. What was best about each company? I loved that I was surrounded by my peers at Accenture – moving down to London and starting a first job post-uni is made a lot less terrifying that way. Everyone was the same age, figuring it out and making similar mistakes. We had a lot of resources and knew where to go for help. Morrisons was a great business crash course and perfect for developing expertise. At Google, it’s about growing this expertise further and working on a wider variety of problems as you help your clients navigate the intricacies of digital consumers, and just learning as you go. Consulting was a lot more high level whereas at Morrisons and Google I get my hands dirty. Sometimes we have to improvise and move on to the next thing. When it comes to life/work balance the busy periods oscillate with every job – as I grow more experienced I am learning to enjoy the periods between projects and really recharge. At the end of the day, it is your responsibility (and privilege!) to make sure that you are working the way you like and want. How does one land a job at Google? It’s about doing all your prep, and then hoping everything works out on the day. I had 5 sets of interviews with 7 different people. They want to understand the way you think and if you fit into the team. Despite the stories you hear, there are no trick questions where someone is trying to catch you out. They were all fair questions which relate to the job, your experience and leadership, and a cultural fit. And everyone was really friendly and responsive throughout the process.